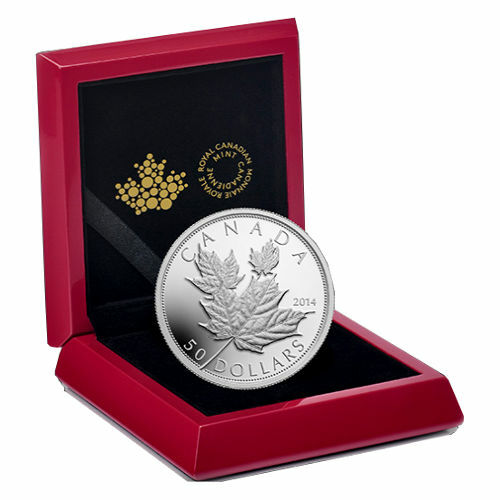 New for 2014 is a 5 oz Canadian Silver Maple Leaf coin from the esteemed Royal Canadian Mint. This unique offering features an ultra-high relief that accentuates tremendous detail in the trio of maple leaves depicted on the face. Minted using a complex and labor intensive multi-strike high-pressure process and hand-polished dies, this coin has garnered unprecedented attention among both collectors and investors worldwide. 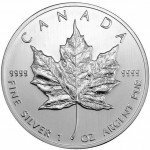 The 5 oz Canadian Silver Maple Leaf weighs five troy ounces and contains 99.99 percent pure silver (.9999 fine). It has a diameter of 65.25 mm and a serrated edge; the legal tender value of this piece is $50 Canadian. Featuring a one-year only design commissioned from Canadian artist Luc Normandin, this popular piece is the first-ever RCM coin to depict 3 drifting sugar maple leafs rather than a single static leaf. Adding to the appeal of this piece is the ultra-high relief; this gives the foliage a stunning 3-dimensional appearance that is normally only found on medallions and medals. 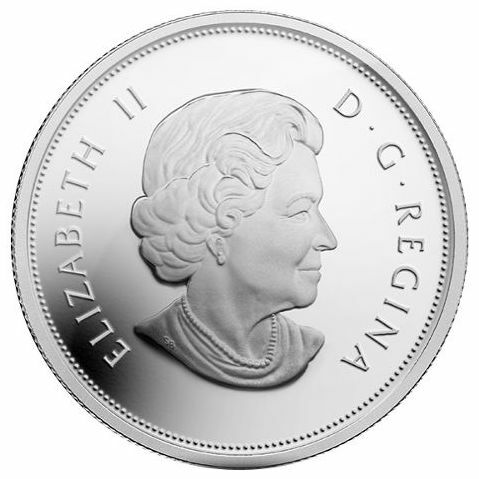 The reverse side of this coin features the latest official profile portrait of HRM Queen Elizabeth II, in keeping with the traditional style of all official Canadian legal tender coins and currency. 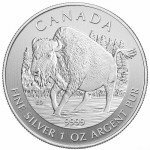 2014 mintage of this exquisite and unique piece is strictly limited by the Royal Canadian Mint to only 2,500 coins worldwide. There is no telling how long these supplies will remain available before they become sold out. Because this premium coin is so visually impressive, it has also become a gift of choice for graduations, anniversaries and weddings. 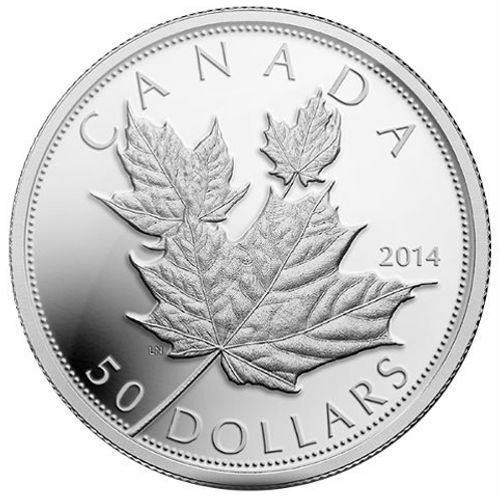 The 2014 5 oz Canadian Silver Maple Leaf fine silver coin is currently in stock and available. To arrange your purchase of this premium piece, simply instant message us by way of our live chat, email or call Silver.com today. We can be reached at 888-989-7223.